Several sources are suggesting that the price for Francisco Rodriguez is falling quickly, and the Mets would do well to wait him out. At five years, $75M, K-Rod is a risk, due to his violent throwing motion and the 408 career appearances in his young career. At, say, three years and $40M, signing him is a no-brainer. It helps immensely that the Angels have moved on — and makes one wonder why they were so quick to leave the bidding. They know K-Rod better than anyone … is there some well-kept medical secret they’re not sharing? The Angels don’t appear to have an immediate in-house replacement, and Rodriguez has been a key to their success for the last six years. Makes one wonder. Also, it helps that the deep-pocketed Red Sox and Yankees have no need for a closer. Further, that the Cubs seem more interested in retaining Kerry Wood than opening up their wallets. The Dodgers are too busy trying to keep Manny Ramirez, and probably aren’t in the market for a closer anyway. With those four clubs out of the running, who is left with the money to take on K-Rod? In the past few years, the Giants have come out of nowhere to make ridiculously high signings (for Barry Zito and Aaron Rowand), so they are always a possibility. The Reds made a big splash last winter on Francisco Cordero — but obviously, they wouldn’t be looking to sign another big-ticket closer. Those two teams in Texas like to do things “big” every now and then, and both could use a bonafide closer, so I’d guess they will be the top bidders for the Mets to watch (ironically, there’s already a Texas sports talk radio station called “KROD“). It may come down to whether K-Rod truly wants to be on the big stage that is New York City. Mets fans — myself included — tend to look at the winter market in a vacuum, seeing things only from the Flushing perspective. Unfortunately, there are 29 other teams in MLB, and many of them are — like the Mets — looking for a closer. When it comes to free agents, the Mets have the advantage of deeper pockets than most teams — and there are few teams willing to consider the figure that Francisco Rodriguez will command. But if the Mets don’t get K-Rod (and hopefully, pass on Brian Fuentes), do they really have a chance to land a solid closer via trade? Omar Minaya has insisted that the Mets “have the depth” to acquire a closer. But, number one, is he talking about a shaky closer (Kevin Gregg), a closer with plenty of question marks (B.J. 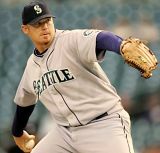 Ryan), a closer who is coming off a bad year (J.J. Putz), or a legitimate, lights-out closer (Bobby Jenks)? I don’t doubt that the Mets have the goods to trade for someone with closing experience. I’m just not sure that I’d (a) be happy with the “closer” acquired; or (b) judge the deal as fair for both sides. The problem is that because most teams in the market for a closer can’t afford K-Rod, most are instead looking to make a trade. These are just a few of the teams likely in the market for a closer: Tigers, Angels (assuming they don’t re-sign K-Rod), Cubs (if they don’t re-up Kerry Wood), Indians, Rangers, Rockies (if they don’t sign Fuentes), Brewers, and Cardinals. In addition, the Braves may be looking to add, say, Huston Street, as a setup man or insurance against Mike Gonzalez. Similarly, the Diamondbacks may not be so convinced Chad Qualls is the answer as their 9th-inning man. The Dodgers are likely looking for an extra arm, with Joe Beimel a free agent and 38-year-old Takashi Saito no guarantee after a major elbow injury. I’m not saying the Mets can’t compete with those teams in trade talks — rather, that the breadth of competition creates increased demand. So instead of the Mets trading, say, Jon Niese and Bobby Parnell for a J.J. Putz, the market condition bloats that package to include Dan Murphy and/or Fernando Martinez. Put another way, instead of getting a Kevin Gregg for a AA suspect (i.e., Michael Antonini), the cost is now an MLB-ready prospect or two (i.e., Niese and Parnell). In essence, paying double. If my theory is correct, the Mets may be better off trying to sign someone like Brandon Lyon to a short-term, inexpensive deal (if that’s possible) — similar to what they did in the 2003-2004 winter with Braden Looper. In other words, get a stopgap, and hope that either the market conditions change, or someone from within (Brant Rustich? Brad Holt?) takes the fast track toward a 2010 / 2011 debut. Add left-hander Joe Beimel to the list of free-agent relievers on the Mets’ wish list. The team also is expected to investigate free-agent closers Francisco Rodriguez, Brian Fuentes and Kerry Wood, and will examine trades and internal solutions while reconstructing its bullpen. As for position players, the Mets maintain interest in outfielder Raul Ibanez, whom they tried to acquire last July and now can sign as a free agent. ..
Not clear on why the Mets would be interested in YALOOGY (Yet Another Lefthanded One-Out Guy), since they already have two of them on their roster. Both Pedro Feliciano and Scott Schoeneweis could have been as effective as Beimel was last year, if only they were used properly. You see, Beimel was used almost exclusively as a “one-out guy” by Joe Torre. In other words, Torre generally didn’t try to use Beimel as a “4-out guy”, a two-inning reliever, a closer, nor as a setup man. Yes, Beimel was effective and his ERA was sparkling in his limited role — but watch those numbers bloat when Jerry Manuel starts using him in every situation under the sun. Kerry Wood is intriguing, on a short contract, but he likely will command a three-year deal at minimum — something I’m not sure he’ll be able to fulfill considering his long history of arm injuries. Fuentes is definitely not worth the 3-year / $36M+ that the market is suggesting. I’m not seeing the Mets buy K-Rod for the 5-year commitment he’s seeking. Raul Ibanez is not a surprise, considering the rumors from July. I was totally against trading anyone with a pulse for him at the deadline, and as a “Type A” free agent, I’m not sure he’s worth surrendering a #1 pick. Let’s wait and see if the Mariners offer arbitration — if they don’t, he’s someone to consider in a left field platoon, on a one- or two-year deal. However, if he doesn’t hit, he’s useless. I compare the erosion of his overall game to Shawn Green’s tenure as a Met. Free-agent infielder David Eckstein is making it known that he wants to play second base next season. Hmmm …. file that thought, just in case …. Next post: we discuss Javier Vazquez.